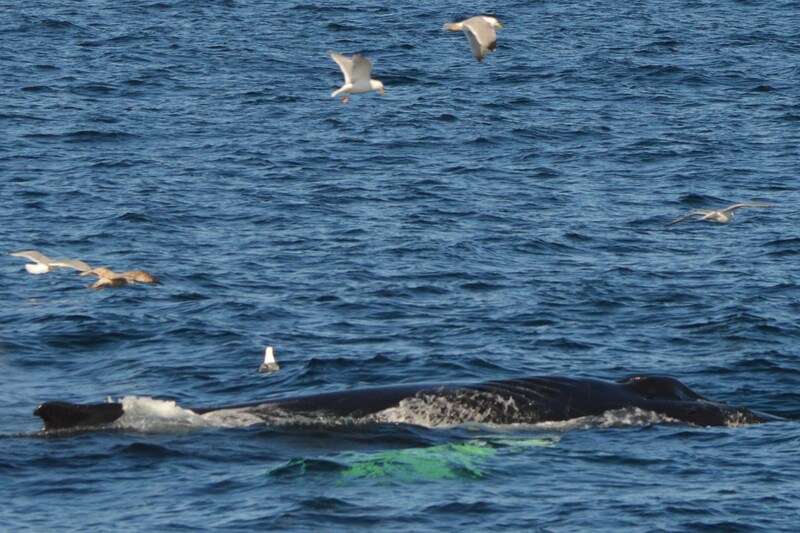 Another great day of feeding on Stellwagen Bank! We traveled south this afternoon and were able to start our trip watching three different fin whales. It really is impressive to think about how large they are- about 70 feet long. The third fin whale allowed us to get some great, close looks! We continued south where we were lucky enough to watch three humpbacks bubble feeding. Even from a long distance, it was easy to see where the whales had made bubble clouds by watching the large cluster of birds at the surface. The birds are there since they cannot dive into the water after fish for themselves, so they wait for the whales to swim underneath schools of fish and hopefully push that bait toward the surface. We noticed, however, that it appeared the fish was a little bit deeper in the water column, between about 3–50 feet deep, so it looked like those birds were out of luck for a little while. 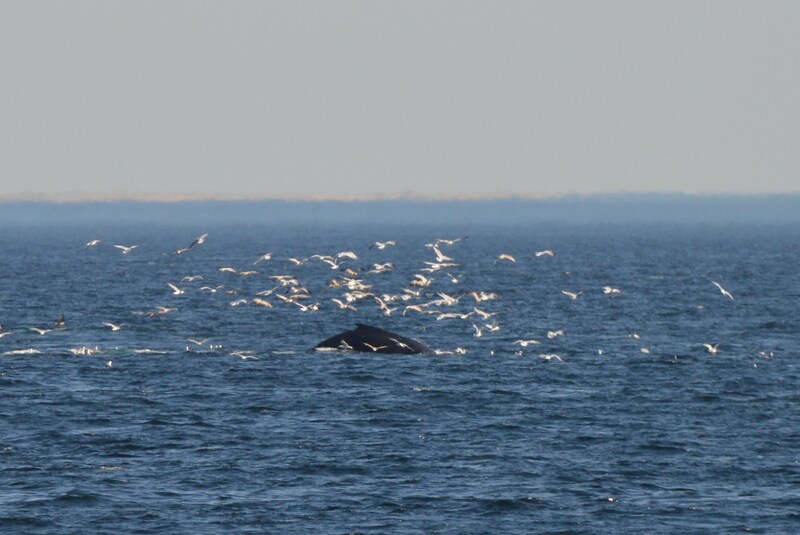 A humpback whale surfaces among some hopeful gulls after blowing a bubble cloud and feeding on schooling fish. We could tell that there were a couple of whales in the area, and after observing for a bit, we identified two of them as Springboard and Amulet. We had a few good looks at them, however the whale we were able to watch the most closely is a whale named Pleats. Pleats was born in 2008 (to a whale named Ventisca) and is named for the propeller scars on the back. These scars have healed and the whale appears to be healthy, but it is a good example of the impact humans can have on other animals. Humpback whale Pleats is trailed by hungry birds. A beautiful day and exciting whales made for a great day!